Have a good Memorial Day Loyal Legionnaires....but don't forget to remember our fallen, fallen in the fight to maintain our freedom. 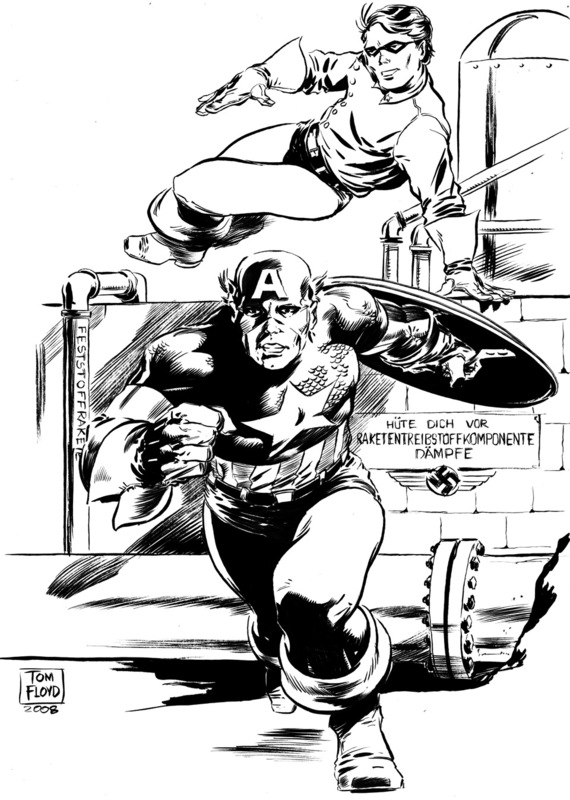 I take World War 2 very seriously, but even at that I like the fantasy elements of it. I can imagine. 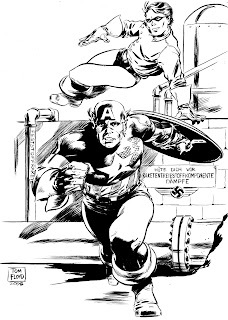 To me the finest job in the world would be for me to draw a WW2 Captain America and Bucky story, and maybe even have a part time job with the plot or plots. I would be in earthly heaven to do such a job. Of course it would be without those stupid ammo pouches the insist on drawing on him now. It seems after all these years he doesn't look real enough....well Marvel, give him to me and he would be real. Anyway I won't rant on that. I just wanted to help out on Memorial day with this drawing. I had another one but can't find it so thought this piece would do that I did for a charity auction in Iowa I believe. And believe me I take it very seriously. I have always said, give a war and a Floyd will show up. My dad was in the 93rd Seabees in the pacific in WW2. My brother in the Army Security Agency in the early days of Viet Nam. I was in the 101 airborne and the 9th Infantry as an combat and depot engineer. My youngest son was part of Operation IronHorse in Iraq. My mother's father even worked in the Navy ammunition depot in Nebraska because he was a career railroader. My mother worked in a 105 shell factory during WW2 waiting for my dad to come home. We all made it home from our conflicts in body. Of course our souls is another matter. So this Memorial Day remember the fallen, and keep your families and friends close. 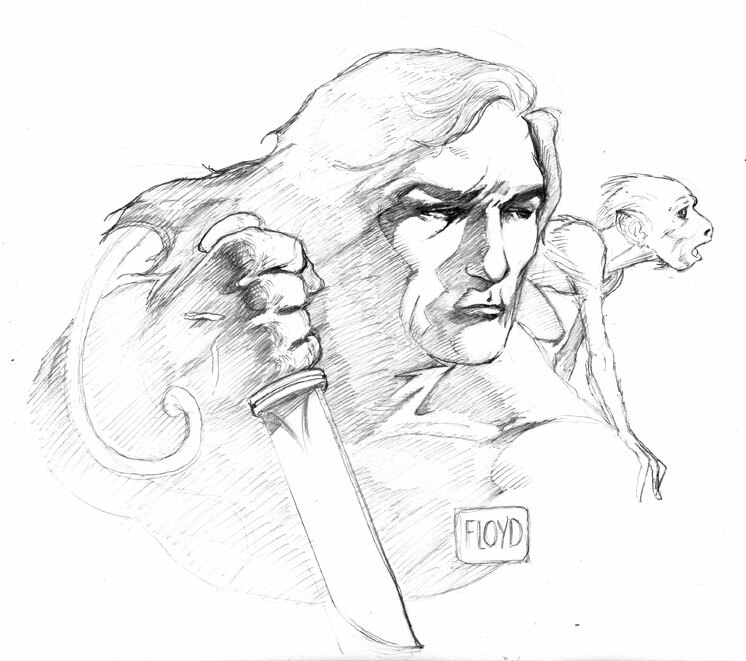 One of the small projects I acquired at the DumDum last year was to do a small Tarzan image for a stamp cancellation postcard for when the Edgar Rice Burroughs stamp comes out. 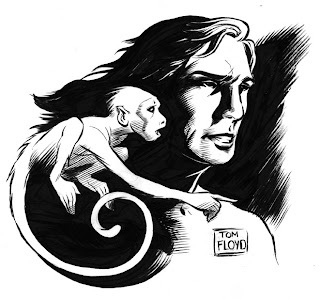 They are hoping, the Burroughs Society that is, that a ERB stamp will be done for the 100th anniversary of Tarzan coming up very soon. So the other day I started with some ideas of what to do for it. They seemed to like the one with Nkima, more than the one of the Tarzan yell. So I went with the Nkima one and started playing around with the design of it. Next I pencilled and inked one. At the time I kind of liked it, but then started to sketch some more and decided I didn't like it very much. So I pencilled out another arrangement of the same subject. I liked this one alot better. 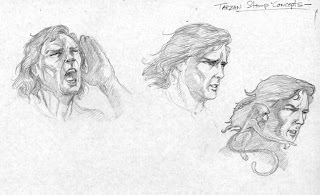 I focused a bit more on Tarzan by hiding Nkima behind him and brought his hand up with his knife in it. So I decided to ink it. I like inking, just sometimes the finished inks don't have the power or emotion of the pencilled piece. But I did the best I could. I kind of think it held it's own with the finished inks. So I can consider this side project finished. I think it survived my inks. Anyway Happy Memorial Day to all my Loyal Legionnaires. But that seems an odd thing to say a happy memorial day just doesn't seem right. So anyway just enjoy the day off if you have one coming. I know I will enjoy any day off I have from the day job. But tonight I am working on Captain Spectre, and hopefully tomorrow too, inbetween mowing and other duties around the secret HQ. Now for a bit of news. I have accepted a project that will help things out. Let me explain a bit. 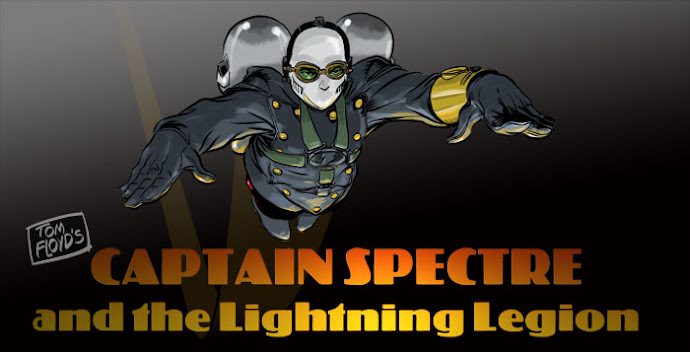 The project will take me away from some time on Captain Spectre. Which isn't a good thing for me because I want this first issue out. 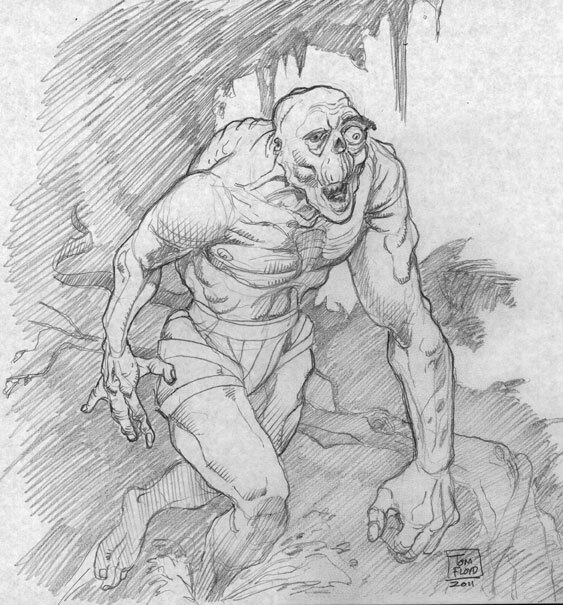 But this new project is created by Sequential Pulp comics to be published by Dark Horse comics. So for one thing that means it is a high profile project published by a powerful comics company. It will be a full graphic novel, done in one type of story. So it will be alot of work for me as I will be handling all the art, letters and colors. But I hope with the added exposure from this project that will bring more attention to me and too Captain Spectre. 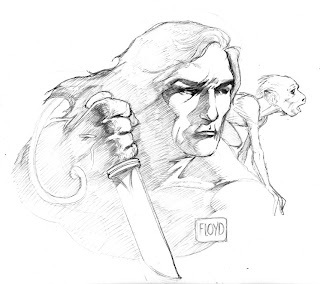 The story is an Edgar Rice Burroughs one shot novel called 'the Monster Men'. The original title to the story was 'Number 13'. It has a bit of everything. It is kind of a frankenstein story mixed with pirates, a bit of jungle adventure, and some monsters....all with a burroughs twist. The official release hasn't been posted yet but should very soon. So it is going to be a tough year coming up for me trying to work on it and Captain Spectre. But I am hoping the combination of high profile and a great story will help out my other work. So I hope all you Loyal Legionnaires understand that I am trying to help out each project as best I can. So stay tuned to this blog for all the action and updates coming on both projects, as always. 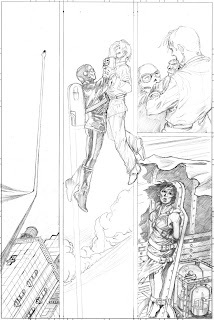 Well Loyal Legionnaires, here is another page from 'Solo Flight' - my first comic novella in the works. This page follows the last one posted as I am working thru the story on a linear basis. I am too narrow focused of a person to try and do it any other way. And once again I hope posting this progress isn't going to affect the millions of sales I plan on having.......hahaha. Just joking you 'all. But you can see one of the bad guys going for a bit of a ride via Captain Spectre airlines, but oops that poor gal seems to be having a bit of trouble in the back of the truck. Maybe it's just a 1939 version of a bad hair day. As before it takes me quite a while to plan out a page and get it all down. 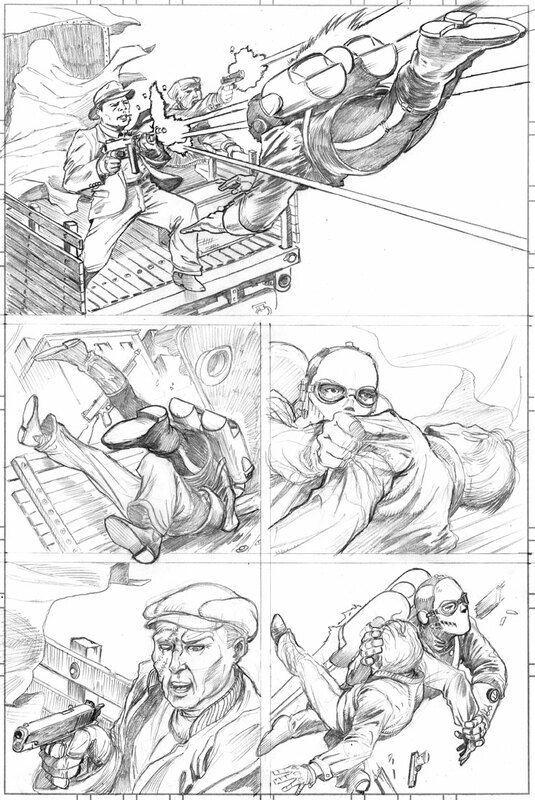 If you notice the pencils are somewhat less refined on this page. I started figuring since I was going to ink them, I didn't need to spend too much time worrying about totally finished pencils. 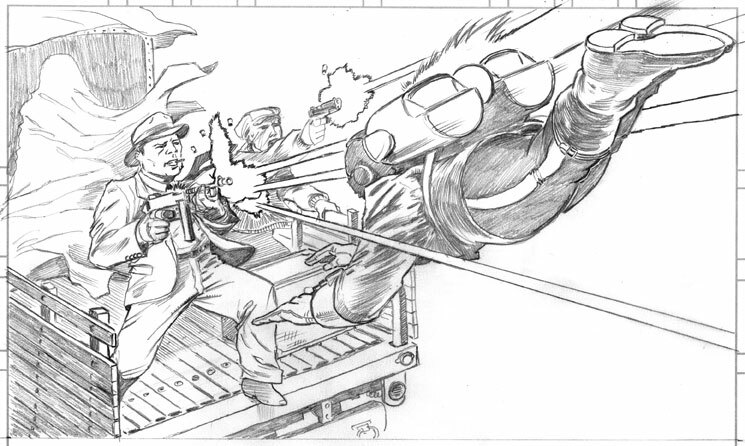 I like doing tight pencils so I am trying to loosen up some on that area to help speed things up a little. That panel from last week was just the top of this page. 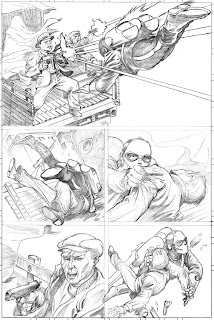 Here are the finished pencils for the whole page. 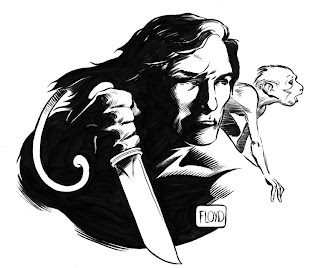 On this page we see some of the fates of two criminals in our story. 'Solo Flight' is kind of a story about what happens to different breeds of criminals. Again I don't like giving away too much of a spoiler, but again I will say this book is pretty much all I am working on lately - other than the day job stuff, and that isn't any fun. I wanted to make sure I got this post up and running, even if it is a bit early on the weekend. I have a few outside chores to tackle and with a chance of rain tomorrow I figured I better finish this up this morning and post it. Then after chores hopefully I will have time for some more pencils. 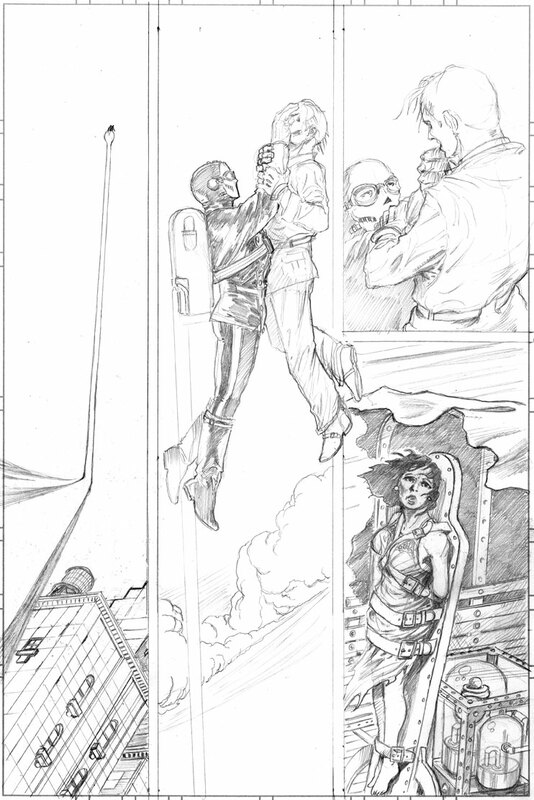 This is kind of an in and out page....Captain Spectre rockets into the page in the first panel and flies out in the last panel, of course with an added payload. And I am sure all you Loyal Legionnaires can tell what is going to happen to the passenger in the last panel. He is going for a bit of a high altitude sight-seeing tour. Enjoy all you Loyal Legionnaires! As the title says, a tough one...this panel gave me a ton of trouble as far as the layout is concerned and also it proved my arthritis is getting to me more than I thought. 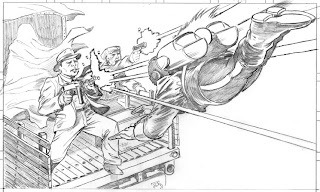 This is the top panel of a page. And I just tried and tried but couldn't get the layout started right. So other than wearing out a piece of board, or comic paper, I drew the pieces one at a time, then lightboxed them together onto a new page. I discovered I don't have any control over my hand movements, well limited control when my arm is extended to the top of a page. In other words the more I reach the less control I have. This is making things tougher to work. But there are work arounds like the lightbox and other things. Getting old is not fun kids. Ha. Isn't the internet a wonder. A place of unlimited reference for artists. I can't count how many times I use it to look up what something looks like. Especially like drawing the Captain Spectre strip. If I need a 1936 police cruiser, then I just type it in and wham there it is. Amazing to this day. And it sure saves alot of time in research and reference. 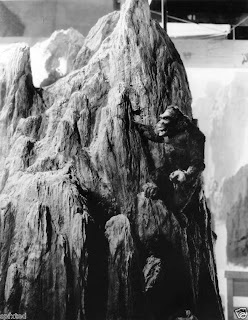 It also yields great gems, like this photo of Kong on the mountain. Being a poor man's collector, I don't have many film books or things like that. I mostly buy comic collection books and things like artist collections, so I had never seen this photo before. And being a King Kong film fan, as I still consider it the greatest adventure movie made, when I saw this photo I just had to reach for the DVD and view it again. I can honestly say that I don't know how many times I have viewed this film. Hundreds for sure. It never fails to make me feel like a kid again. Then of course the big news, and this is what I think one of the better cartoons of the event. 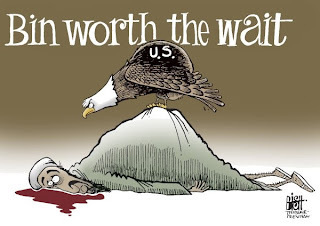 Most had political sides taken but this one was more American so I liked it better. Of course it is copyright by the artist, I am just reposting because I liked it. As some of you know I have a personal stake. One of my sons served in the War on Terror in Iraq for almost two years, and made it back home from the frontlines. Also some things stay the same as in enemies can only hide so long, either from Seal Team Six or Captain Spectre. 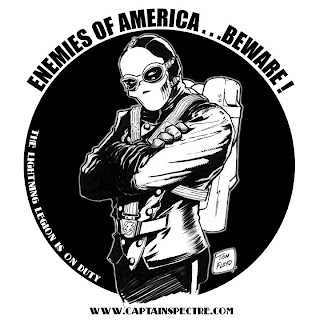 As shown in one of the first Captain Spectre shirt designs I did when the strip started. I wanted to get this update posted as I will be spending some time with the northern branch of the Floyd family today. They are coming out to the secret HQ for a cookout. So happy Mothers day to all the mothers out there. And to my mom, long gone, Thanks Mom.